If you were to ask me what my favorite aspect of Washington’s landscape is, my answer would be unbending: waterfalls. Rushing rivers and mountainous terrain makes for some of the most magnificent views—views that NEVER fail to take my breath away and make me feel in awe. Not every state in the country has the pleasure of having so many breathtaking waterfalls in their backyard, and it’s a benefit I try not to take advantage of. Rather, I’ve made it a goal, and consider it a true joy, to visit as many dog-friendly waterfalls in the state as Moo and I can. What’s even better? 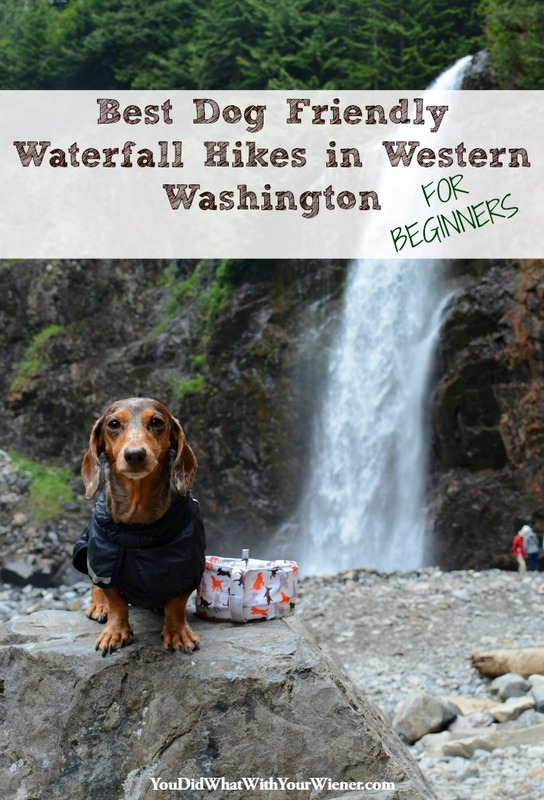 Many of Washington’s most well-known waterfalls don’t require difficult hikes, and are easily accessible to hikers AND dogs of all different skill levels and ages. I strongly encourage anyone who has a desire to get outdoors with their dogs, but may be intimidated by a lack of experience, to consider starting with Franklin Falls. This hike will always have a special place in my heart because it was the first waterfall that Moo and I both visited in the Pacific Northwest. Moo and I have since been back several times, in both the summer and winter when there was plenty of snow on the ground (she had no trouble with it even though she has short legs). The hike is beautiful, with coniferous trees and ferns lining the trail, and a clear river running alongside for almost the entirety of the one mile walk. The roaring 70-foot waterfall is close and intense once you reach the end of the hike, so plan on getting a little wet from the spray if you don’t keep your distance. 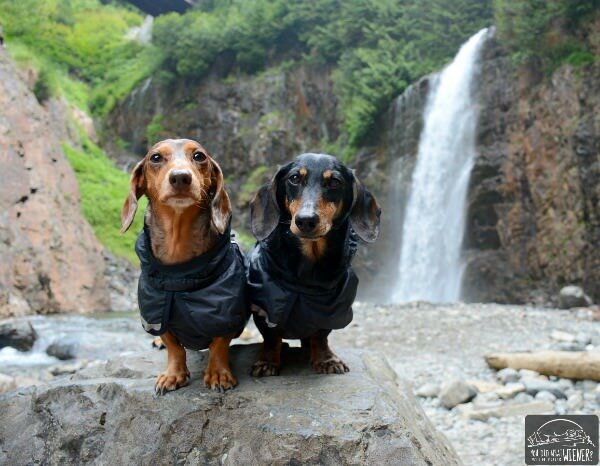 This hike is located in Snoqualmie Pass and is 2 miles (roundtrip) with well paved trails and rock steps that make the short hike to the falls easy and safe for hikers big and small, and of course, for our short four legged companions. The elevation gain is minimal—only 400 feet—so you and your dog don’t need to be in any kind of exceptional shape to make it to the falls. I should warn you, however, that at the end of the hike near the waterfall, there is a short, rocky climb down to ground level that can sometimes be slick from water spray. Don’t let this be a deterrent, just wear a solid pair of shoes and don’t rush getting down, and you will be fine. Another wonderful thing about Franklin Falls? It’s equally as beautiful in all seasons. The waterfall turns into, basically, one sparkling, magical frozen icicle in the winter. Just make sure you look into trail conditions before you set out for your adventure—the road leading to the trail can sometimes get blocked with snow or closed due to safety concerns. 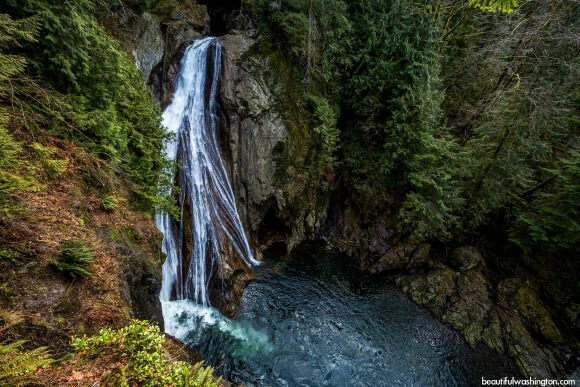 Twin Falls is a 2.5 mile hike (roundtrip) located near North Bend, and is one of the more popular hikes in the area. The first portion of the hike is relatively flat and will take you alongside a river with sizable boulders. Aside from providing a beautiful view, there are certain places within the river where the boulders block the strong current, in turn creating safe spaces for small fish to live and dogs to swim and play. Gradually the hike will begin to lead you more uphill, with switchbacks that will lead you to a resting spot with benches and the first view of the falls. I highly recommend continuing along the trail to get to the lookout points of the falls. It’s not much further in, and it’s the view there that makes the hike well worth it. When I took Moo on this hike, she had no struggles making it uphill, even in the places with rock steps and stairs. The 135-foot waterfall itself is pretty magnificent, painting the image of strands of thread cascading down the rock face of the cliff. If you continue a little further up the trail, there’s a well-made bridge that will give you a second glimpse of the second waterfall (thus, Twin Falls). Admittedly, this also a great place to snap some pictures of your pup, as I am so guilty of doing on multiple occasions. Overall, this waterfall hike is easy to moderate, and able to be hiked by young kids, old adults and dogs of all shapes and sizes. While it may be muddy at times, the view along the trails is wonderful, with the pathway being framed by ferns, moss-covered trees and old growth forest the whole way through. This waterfall is one of Washington’s most popular scenic attractions, and it is by far one of the most guest friendly, as it requires no hiking to actually see and admire the falls, but offers a trail down to the river if you’re feeling up for a little exercise. 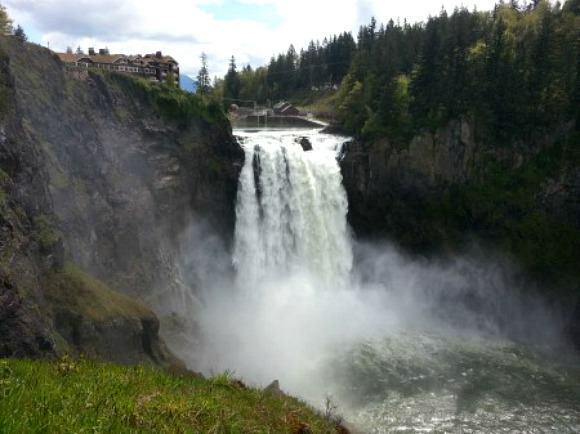 It’s a beautiful waterfall with an even more interesting history (read more about the interesting history of Snoqualmie Falls HERE), making it an informative and fun hike for novice hikers and leashed pets alike. Snoqualmie Falls Lodge has a gift shop, observation deck, a lodge, informative signs explaining the Fall’s history, and lights that illuminate the waterfall at night—the whole shebang, basically. It really is more of an attraction than a hike, but worth seeing in my opinion. The hike down to the second viewpoint of the falls is nothing rigorous, but I will say that I remember being pretty winded making my way back up the trail. If you want to see the falls from the lower perspective, but don’t want to tackle the hill, you can drive past the lodge to a lower parking lot. Snoqualmie welcomes close to 1.5 million visitors each year, so prepare on sharing the view with multiple other people when you visit, especially if you’re going on a nice day. If your pup isn’t a fan of crowds or other dogs, you may want to consider this before choosing this location. A general rule of thumb with waterfalls: the worse the weather the better the view, as rain and snow create a much stronger, louder and awe-inspiring waterfall. The great thing about Snoqualmie is that you can enjoy the thunderous roar of the waterfall (and even standing hundreds of feet away, you will still get wet with mist), without getting muddy or having to navigate sketchy trail conditions with your pup, making this a great place to visit year round. Mashel Falls is located in Eatonville, about an hour and a half away from Seattle. These falls are tucked away in the Pack Forest area, and consist of three different waterfalls along the trail: lower, middle and upper falls, which present themselves in order as you follow the river. While the hike itself is beautiful, especially on a sunny day when rays of sunshine peak through the forest leaves, the trail itself is notoriously difficult to find. There is an administration building that will hand out maps, which, after reading quite a few reviews, are your best bet in finding the CORRECT trailhead. Moo and I went on this hike about a month ago on a drizzly day, and while we did make it to the upper falls, we were never able to find the trailhead that would have led us to see all three. The hike to the Upper Falls was a little hairy, but in the very least had ropes to hold onto for sections of steep decline. Per usual, Moo had no issues navigating her way down and over the rocks and mud, and ended up having to patiently wait for slow old mom (me) to cautiously make her way down. As for the upper falls: they were beautiful and peaceful. Not nearly as strong and demanding of attention as Franklin or Snoqualmie, Mashel Falls were relatively secluded and calm, allowing me and Moo an opportunity to sit quietly by ourselves in the surrounding forest, and take it all in. While we didn’t get a chance to visit them, I’ve read online that the lower falls has a nice, calm lagoon-type area that is great for dogs to swim and play in, and that the middle falls (which many feel are the most beautiful of the three) have an area that allow you to walk behind the waterfall, which is not a treat that many waterfalls allow. 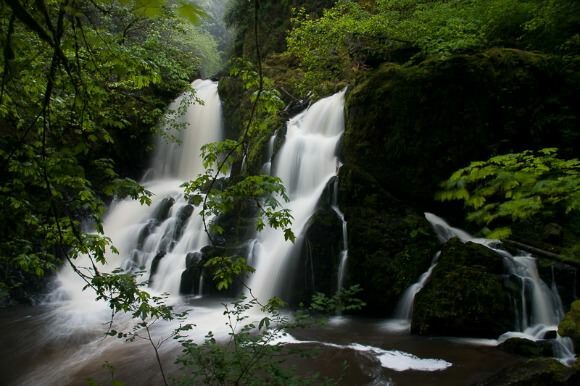 Panther Creek Falls is located near Carson, WA and is considered to be one of the prettier falls in the state. It’s a part of the Columbia River Gorge, so imagine canyons, electric colors and a sense of being tucked away from the rest of the world. It’s only a half mile hike roundtrip, so (really) not much of a hike at all. Still though, it’s a dog friendly area and is great for novice hikers who want to get outdoors but don’t have tons of experience. The falls themselves (there are two tiers) empty down a canyon and into the same basin, and are surrounded by draping plants and vibrant green moss. A viewing deck was constructed recently in order to eliminate climbing risks and allot visitors a place to admire the view. If one is feeling adventurous, people are allowed to descend to the base of the falls, but should be aware that doing so requires some technical scrambling, and can be risky. This is the only waterfall listed thus far that I haven’t had the pleasure of visiting, and hope to do so soon. 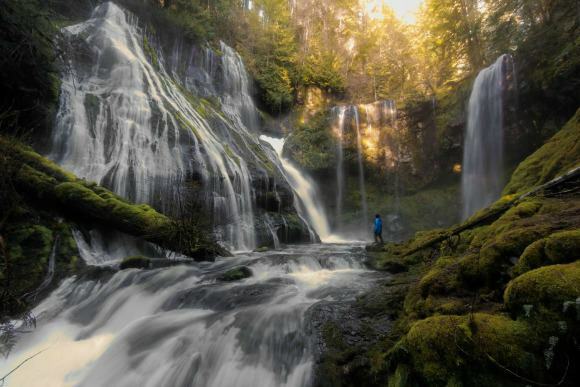 The great thing about Panther Creek Falls is that it is located in Gifford Pinchot National Forest, so it’s easy to pop in, see the falls, and spend the rest of the day hiking other trails in the surrounding area. There really is no way of saying which waterfalls in Washington are the best—there are SO MANY, and let’s be honest… waterfalls are somehow always magical in their own way, no matter how big or small. If you’re new to being outdoors or want an easy hike that you and your dog can tackle, perhaps start with some of these. That being said, there are hundreds of beautiful waterfalls waiting to be explored in the Pacific Northwest. If you’ve had opportunities to explore various waterfalls in the Washington, I would love to hear some of your favorites. I love taking my collies hiking to waterfalls! (Which is obvious by all our the waterfall pictures). We are on the East coast though, so we won’t get to see these. Hi Laura. You are correct. Thanks for catching that. I didn’t see it when I edited Elena’s article but I’ve fixed it now. Thank you for this article! So many “hiking with your dog” articles are geared towards those with larger dogs. I have shih tzus and don’t think they could do 6 miles. This is really helpful information for me! Don’t underestimate them! Ha, ha. When my Dachshund Gretel is in good hiking shape she can easily hike 7-10 miles in a day. I can barely hike that myself so that is her limit. Every human and dog has their own limits though. Thanks for the compliment on my article. I do really want to see more small dogs out on the trails and everyone has to start with the easier ones, even if they choose to go longer later in the season.